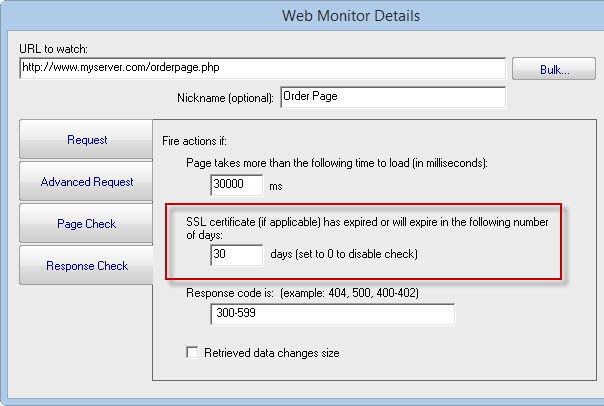 What is SSL Certification Expiration Monitoring? Websites that show the lock icon in the URL bar are secured using an SSL Certificate. Certificates are good for a certain time frame, and have to be renewed before they expire. After they expire, they don't protect the website as completely as they good. 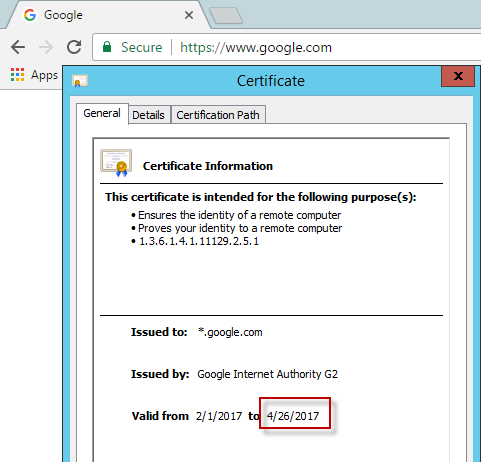 In the example below, we see Google.com's certificate will expire on April 26, 2017 (still two months away from this writing). Google takes security very seriously so they will renew this certificate before it expires. It's important to know that an SSL certificate is going to expire so it can be renewed in time, which involves getting a new certificate file and getting it uploaded and configured on the web server. Since it's easy to forget that an SSL certificate will expire, it's recommended to have software monitoring this for you - something that will send you an email reminder while there is still plenty of time to get an updated certificate. PA Server Monitor's Web Page Monitor can check how fast a web page loads, if there are errors on the page, and more. It also can alert you if your SSL certificate is getting closed to expiring, as shown below.